The VB3 was a memory mapped video display board that provided a flexible video display system for S-100 bus computers. A maximum of 4096 bytes of contiguous memory could be directly mapped to the screen as characters or graphics. The display could be programmed for up to fifty 80-character lines (or 51 on European standard monitors) featuring upper and lower case letters with discerners. Optionally, the user may display 20, 32, 40, 64, 72, 96, and 132 characters per line using optional mapping PROMs available at extra cost from SSM. 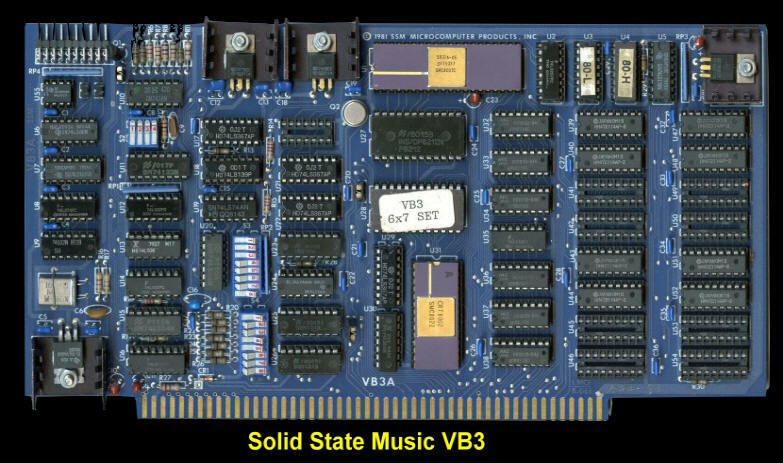 The VB3A features a second RAM block in addition to the video RAM which contains "attribute" bytes to control the display of each individual character. These attributes allow any individual character to appear as a standard alphanumeric upper/lower case font or an alternate user-programmed font. (SSM included one alternate character font with the VB3. This was a 6 x 7 matrix character set for displaying the maximum number of text lines using the lowest number of raster lines possible.) In addition, the character may be displayed in normal or low intensity, reverse video (black on white), with an underscore or strike-through mark, blinking, blanked, or as a thin line or dot graphics. The manual for this board may be obtained here. Jon Bondy wrote a nice review of this board in March 1981 for Microsystems (Vol 2, #2, p26). It can he seen here.